Caspian Wharf’s price ranges from £170,000 to £550,000. Since February this year, more than half of the international buyers who have been scrutinising properties in London have been Asians, says a British developer who is here in Kuala Lumpur to promote its apartment project. Berkeley Homes (Capital) plc operations director Pier Clanford says that while Europeans, especially the Italians, have historically been keen purchasers, he is increasingly seeing more Asians since the early part of this year. The Russians and the Middle Easterners are the other interested groups. 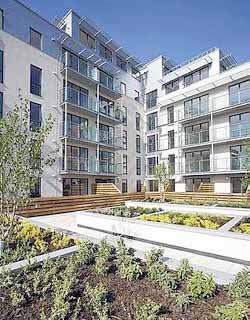 Berkeley Homes is part of the Berkeley Group Holdings plc, one of the largest developers in Britain. Besides Berkeley Homes, the group also has the St James and St George groups in its stable. Clanford says the group’s preference is for central London or southeast suburbs of the British capital. “Asians are buying to take advantage of the drop in the property value and the cheaper British pound (RM5.70 to £1 compared with RM7 in September 2008),” he says. Excluding central London, some areas have dropped by 25%, says Clanford. In cities like Manchester and Birmingham, the drop could be greater with slower recovery. Since the beginning of this year, the group has been promoting its properties in Malaysia, Singapore and Hong Kong. Several of the projects were also marketed in India. Because of this interest on the part of Malaysians as seen in these earlier promotions since the downturn in 2008, the group will be bringing in more projects in the next several months to Kuala Lumpur. Previously, they only went to Hong Kong and Singapore. Clanford says other projects include Imperial Wharf (SW6), Merchant Square by Paddington Station, Beaufort Park (NW9) and Royal Arsenal in Woolwich (SE18). “We are trying to get our specifications and pricing right. What we have discovered over the months is Malaysians’ interest for 2-bedroom units of between 700 and 800 sq ft with the price band between £150,000 and £350,000,” he says. “The entry level has been lowered quite a bit with the current downturn,” says Clanford. Besides gaining advantage from the cheaper pound and the drop in price value, the prices offered here are also lower than those in Britain. (It is a lot more expensive for developers to promote the properties in Britain than it is in Asia. Also, as properties were sold at a certain price in London before the downturn, developers are unable to drop their prices. However, they have that option when they bring their projects here). Clanford says Malaysians who opt for 2-bedroom units buy for their own use and for their children studying there. Hong Kong buyers, who generally prefer one-bedroom units, have a higher appetite for risks while Singaporean buyers prefer 2- and 3-bedroom units, and go for more upmarket projects. On the whole, the Asian buyers’ preference are for projects which are near the public transport system, universities and easy access to amenities like shops. Caspian Wharf, the project being showcased here, comprises 550 units. Eighty-five units are put up for sale in the region. Prices range from £170,000 to £550,000. Its second phase will be offered for sale in Kuala Lumpur in November. The project will be ready for the 2012 London Olympics. International property consultants King Sturge who is accompanying Clanford on this Asian tour says London’s property market continues to be depressed compared with the Singapore and Australian markets. James Talbot, a partner in the company’s residential investment and development consultancy section, says the Singapore market is driven by local consumption with some international investors while the Australian market is faring well. “Britain’s property sector continues to be depressed, which is why we feel this is the time to buy. It is a discount of 40% to 45% if we compare the current prices today with the 2007 prices when the property market was at its peak. There is now more room for negotiation,” he says. Malaysians are generally quite a frugal lot and believe in saving for rainy days. That should explain why we have one of the highest savings rates in the world at 32% of gross national product. There are in fact many rich Malaysians who are looking for quality properties to invest in. Malaysian buyers constitute one of the largest foreign buyers in Singapore; many do this with investment in mind or for having a holiday home. That could be the reason why developers from overseas, including Australia and as far as Britain, are targeting Malaysian buyers and are showcasing their projects in Kuala Lumpur. Berkeley Homes group, one of the largest developers in Britain, is a regular foreign developer with outings to Kuala Lumpur to woo our buyers. Last month, its subsidiary, St George was in the city to promote Battersea Reach in the township of Battersea and Aquarius House, on St George Wharf in Vauxhall SW8, south of London. Averaging £200,000 to £350,000 for a 800 sq ft apartment or around RM1,500 to RM2,600 per sq ft, these properties are not exactly cheap by Malaysian standards. Although most of the buying activities are from parents who have children pursuing their education in Britain, there are also those who are frequent travellers and enjoy the lifestyle there. Those still with spare cash to invest will be on the lookout for good property to buy in Malaysia and buying activities are expected to resume when there are clearer economic and market directions. For now, the majority of buying activities are still by first-time home buyers and for medium-priced property, while buying for high-end property has been markedly decimated by the global financial crisis. One of the reasons could be that many of the high net worth buyers are out on “bargain hunting expeditions” to pick up overseas properties that have eroded in prices. It is about time developers come up with the right products to attract these high net worth buyers and some of the high-end products will likely make their way to the market next year. The pro-active stance adopted by industry practitioners will ensure they have the right products to offer and they will go the extra mile to design and market them well. In fact, the pace and quality of property development in the country will depend on other factors including the rate of population growth, people’s changing lifestyles and economic activities. Although the residential property sector has been the main driver of the local property market in the past, commercial property has the potential to grow in importance, especially with the advent of real estate investment trust. Malaysia has many promising services-related businesses that should be tapped and harnessed to generate a more positive impact on the real economy and real estate sector. Among the sectors that easily come to mind are tourism, education, healthcare, retailing, food and beverage, and financial services. These businesses will continue to grow in importance in the coming years and will contribute to more job creation and economic growth for the country. Having a robust services sector will have a significant impact on the real estate sector, especially commercial real estates, which are still largely in the doldrums as a result of the global financial crisis. Many cities around the world that have drawn big numbers of businessmen, investors and visitors to their shores mostly started out as successful business and financial hubs. From Singapore and Hong Kong to London, Paris and New York, these global cities are renowned for their highly efficient and top-notch infrastructure as well as corporate and public governance. All are international financial centres and have well developed services sectors and facilities. With more concerted efforts to further develop Malaysia’s services sectors, hopefully more opportunities will emerge for the people in terms of business opportunities and employment. Meanwhile, property industry players will also be able to partake in more quality developments for the enlarged sectors. ·Deputy news editor Angie Ng hopes industry players will introduce more vibrancy and refreshing designs to their post-crisis property projects, both residential and commercial.